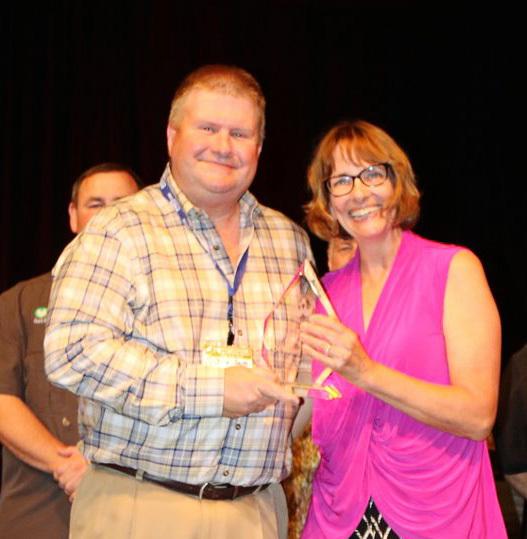 Dr. Susan Watkins, University of Arkansas Poultry Extension Specialist, was presented with the 2016 Industry Leader of the Year Award by The Poultry Federation at the 57th Annual Poultry Festival held June 17-18 in Rogers, AR. Dr. Susan Watkins has served as the Poultry Extension Specialist for the University of Arkansas Center of Excellence for Poultry Science since 1996, impacting the local poultry and egg industry and the industry around the world. Dr. Watkins is renowned as an expert in water quality and provides critical technical support to the industry in litter management, nutrition, lighting and sanitation. Dr. Watkins has grown deep roots within The Poultry Federation. She has worked tirelessly over the years to plan and execute the annual Live Production Symposium. She develops topics, arranges premier speakers and plays a vital role to organize what has become the largest and best symposium in the country. She also serves as the Secretary and Program Coordinator for The Poultry Federation Turkey Committee. Dr. Watkins is highly revered among poultry science students at the University of Arkansas and vice-versa. She invests significant time and effort to mentor and teach The Poultry Federation scholarship recipients and beyond. Dr. Watkins also serves as the Director of the U of A System’s Division of Agriculture Applied Broiler Research Farm; Coordinator of the Applied Broiler Research Farm Field Days; and Poultry Science Departmental Internship Coordinator. The Industry Leader of the Year Award is presented by The Poultry Federation beginning in 1955 to recognize the outstanding achievements of poultry and egg business executives as well as their contributions to the industry. The 2016 award was presented by The Poultry Federation President, Marvin Childers and members of the Board of Directors.